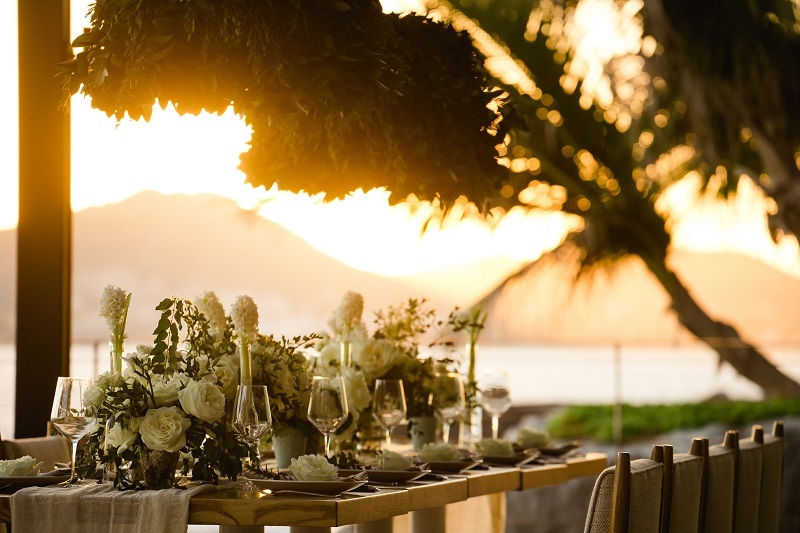 OUR WEEK OF WEDDING INSPIRATION AT THE CAPE HOTEL is sadly coming to an end, but not before we share with you one more magical wedding setting! 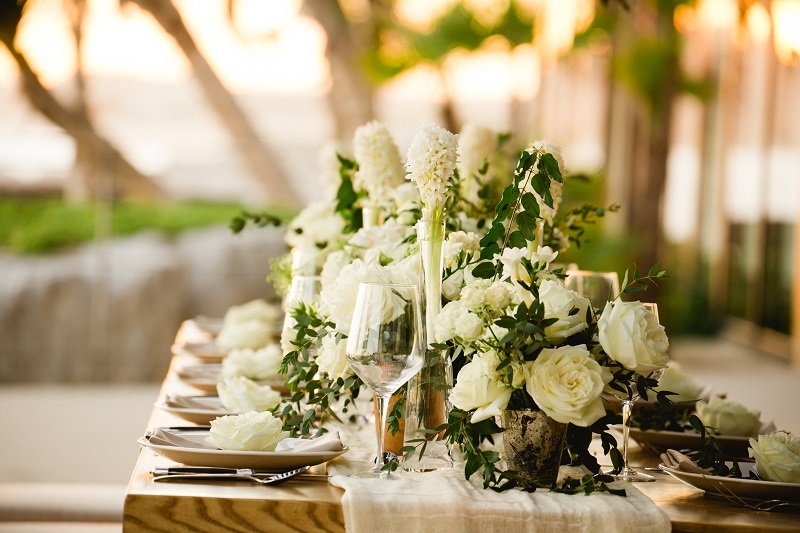 This dreamy, romantic all-white wedding reception tablescape at the Ledge! But first, if you missed our Wedding Ceremony or Reception on the Rooptop posts earlier in the week, stop right here, turn around, and go back in our blog to see them! Why? 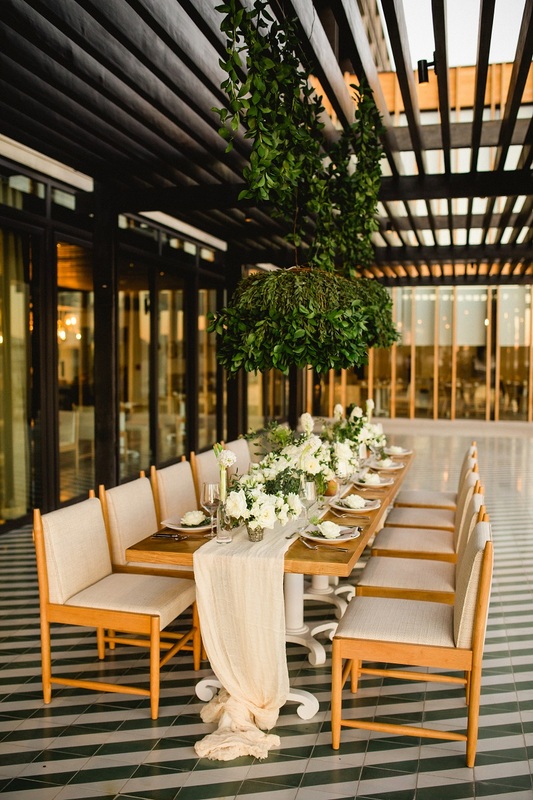 Because The Cape, a Thompson Hotel, is not your average wedding venue. 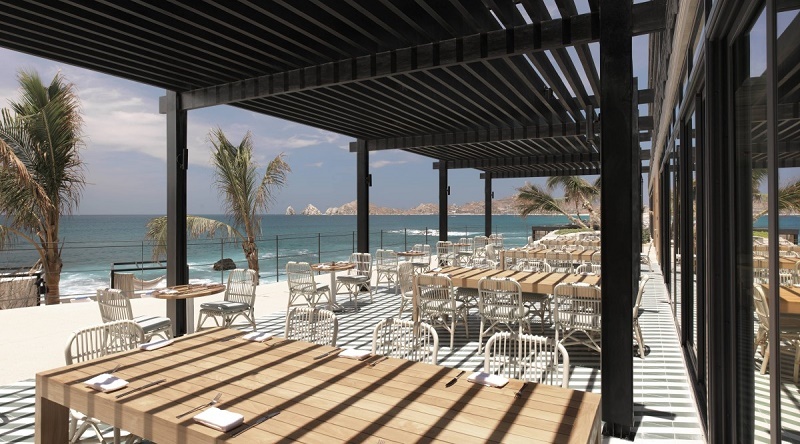 The Cape’s location, along one of the most desirable and secluded playas in all of Los Cabos, promises to blow your mind with its stylish modernity. It’s got that luxuriously laid-back Southern California vibe we know you’ll love as much as we do! 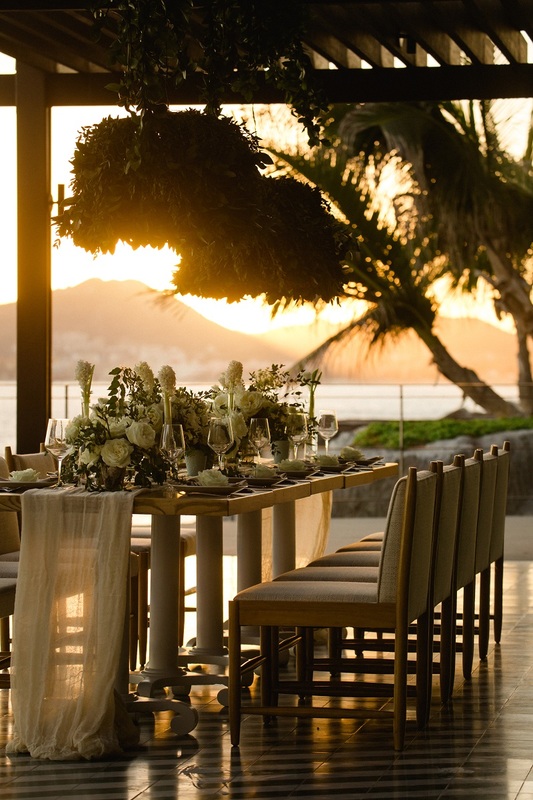 And our first two posts, with breathtaking photos by Chris Plus Lynn Photographers, only scratch the surface as to how amazing this chic beach hotel is and the potential it holds for your destination wedding. WITH MANY BEAUTIFUL SPACES to choose from at the resort, from the A-Frame to Glimpse, the Rooftop and the Terrace, to name a few, you can introduce your guests to the entire hotel property over an entire weekend of celebration. 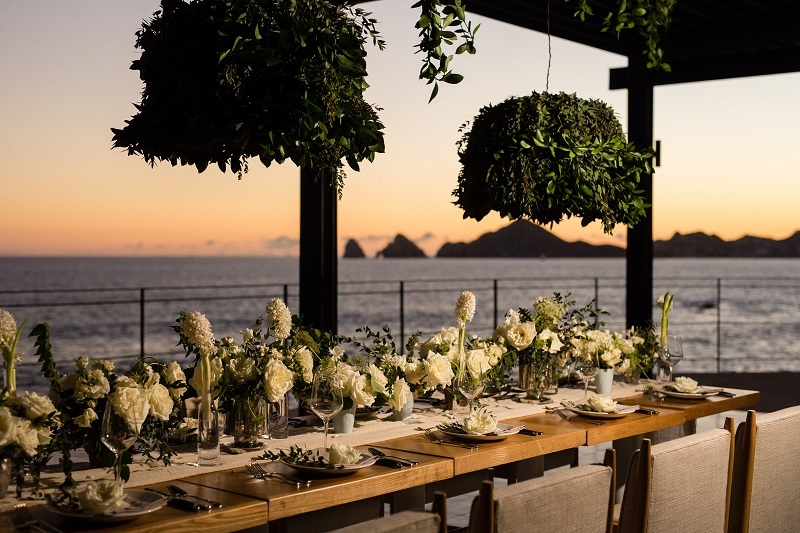 One of the most stunning event spaces at The Cape is Ledge, the hotel’s beach house-inspired restaurant imbued with a casual ambiance—yet there’s nothing casual about the breathtaking views. 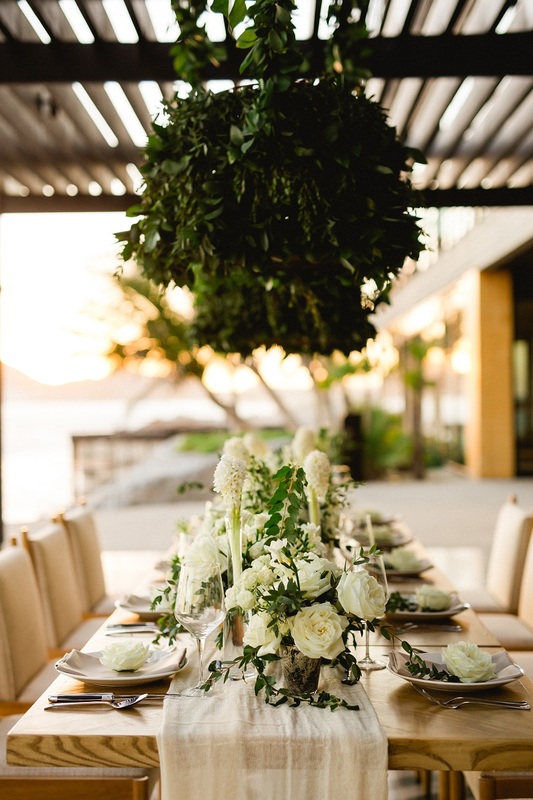 The restaurant’s expansive terrace drew us in and our all-white dinner tablescape blossomed into reality! 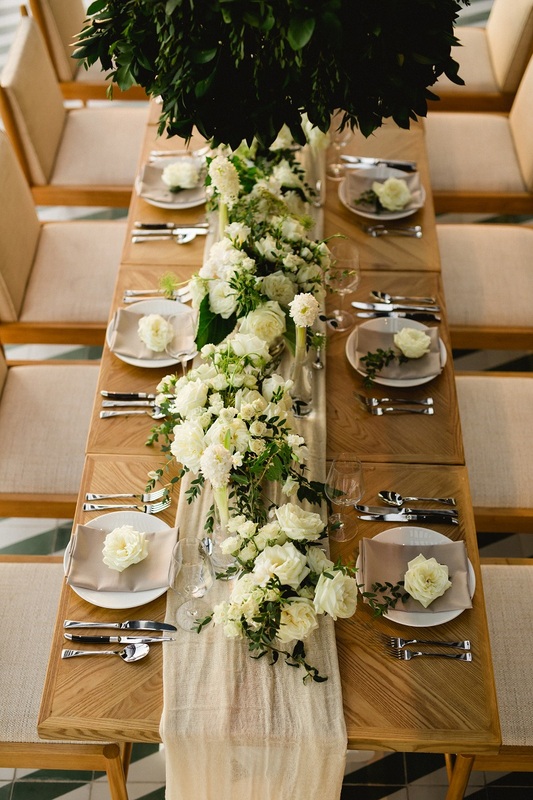 THE NATURAL ELEGANCE of the hotel itself inspired our Ledge tablescape. 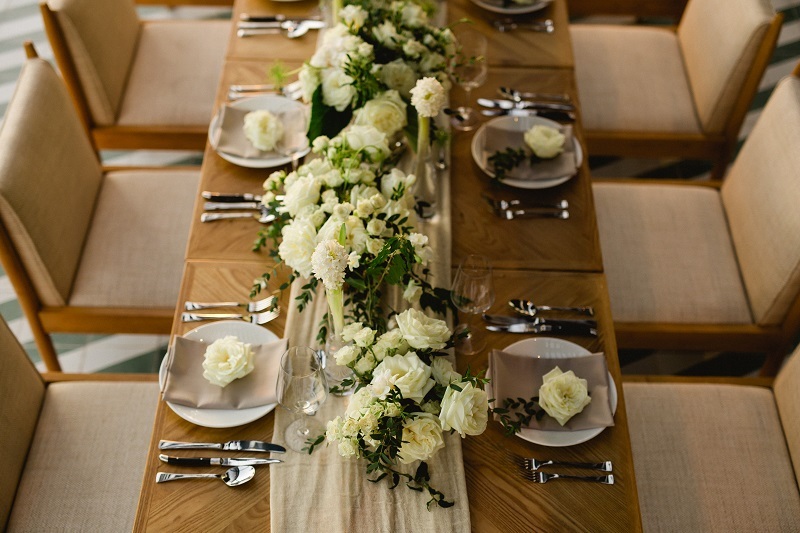 We used the hotel’s existing wooden tables and woven linen chairs to create one long feast table. 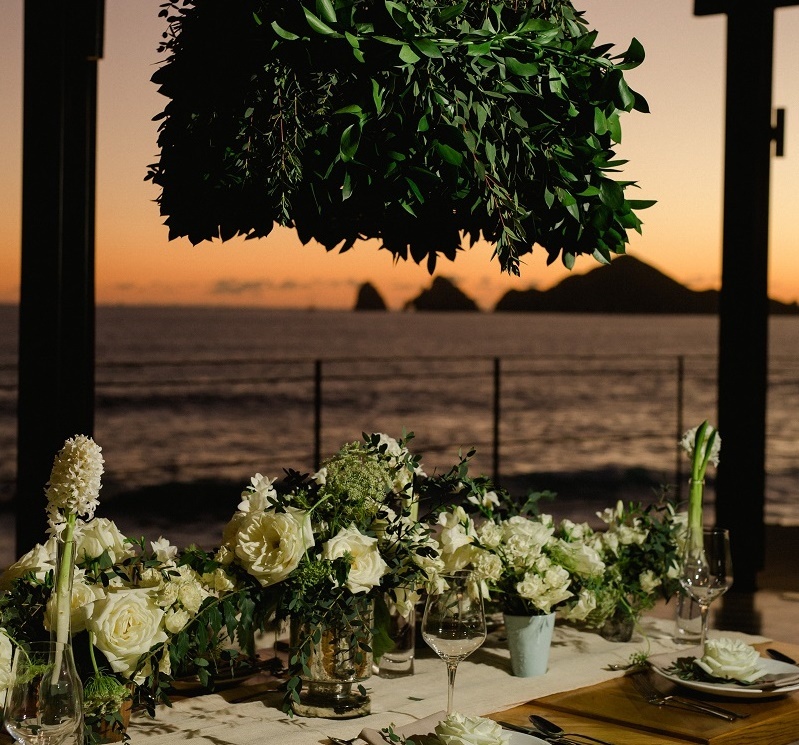 Then, we positioned the dinner table under the pergola and suspended two of our Green Leaf Lampshades over the setting. 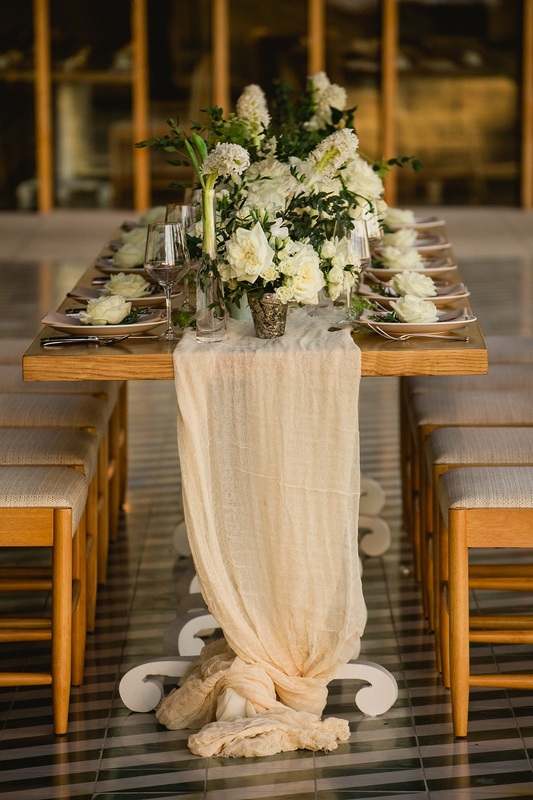 Down the length of the table we draped natural gauze fabric as a runner, allowing pools of the fabric to collect and intertwine at the base of the table. Next came multiple, locally-made terra cotta pots and small sculptural glass vases, each filled with a bouquet of ivory flowers. Local and imported blooms were used in their full fragrant glory, such as Hyacinths, Roses, Tea Roses, and Freesia. 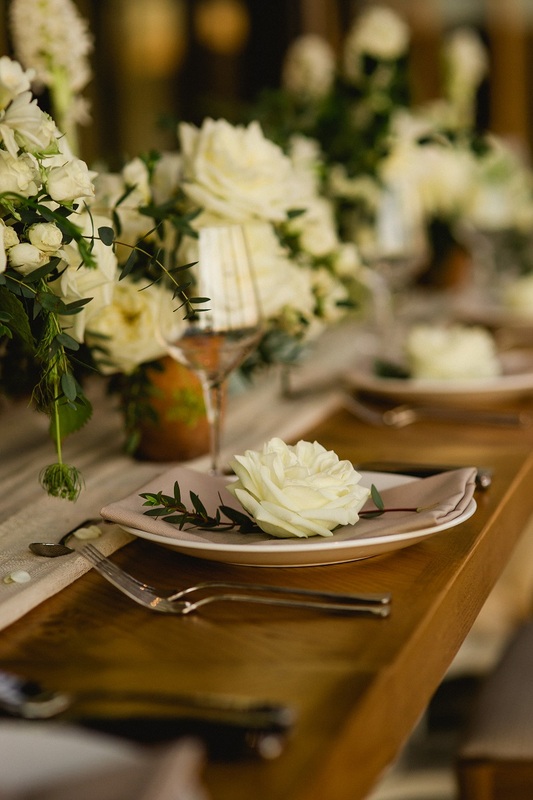 All nestled with green vines, whole leaves and wildflowers for a natural, organic garden feel that danced down the center of the table. 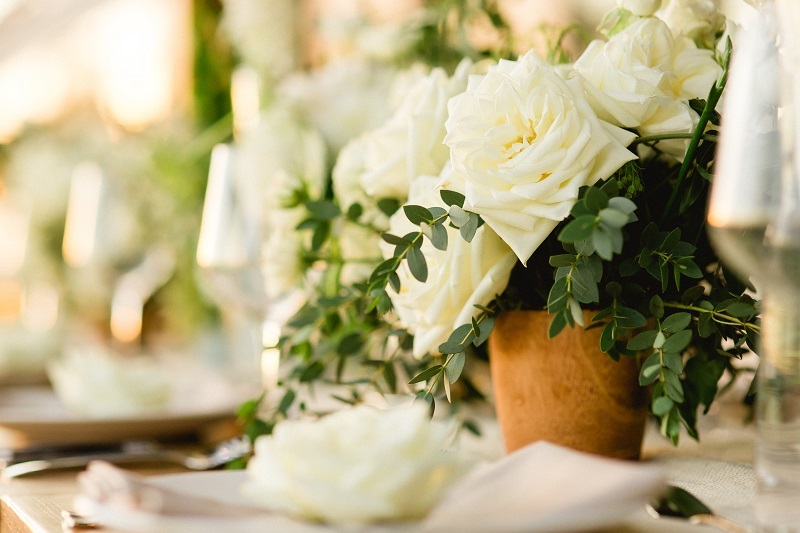 And, each place setting held a full-blown garden rose as a sweet smelling personal touch. 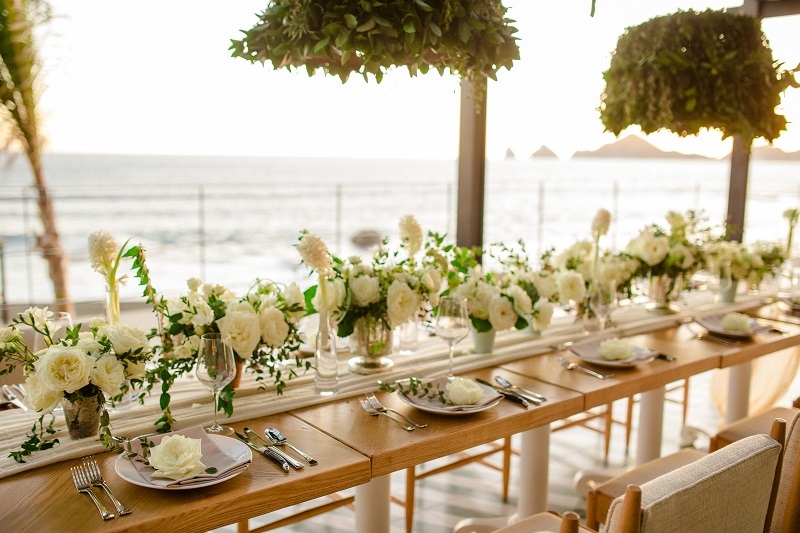 AS THE SUN SET OVER THE OCEAN and the light turned golden amber and rosy pink, the table warmed and the entire Ledge patio was beyond romantic! BEYOND! Can you just imagine sitting there yourself, sharing the moment with your beloved? Yeah, we know. Ah-mazing. Truly. WE WARMLY THANK THE CAPE, A THOMPSON HOTEL for the opportunity to play at their beautiful new hotel, as well as our dear friends at Chris Plus Lynn Photographers for capturing all the beauty of the hotel AND our work inspired by the venue. 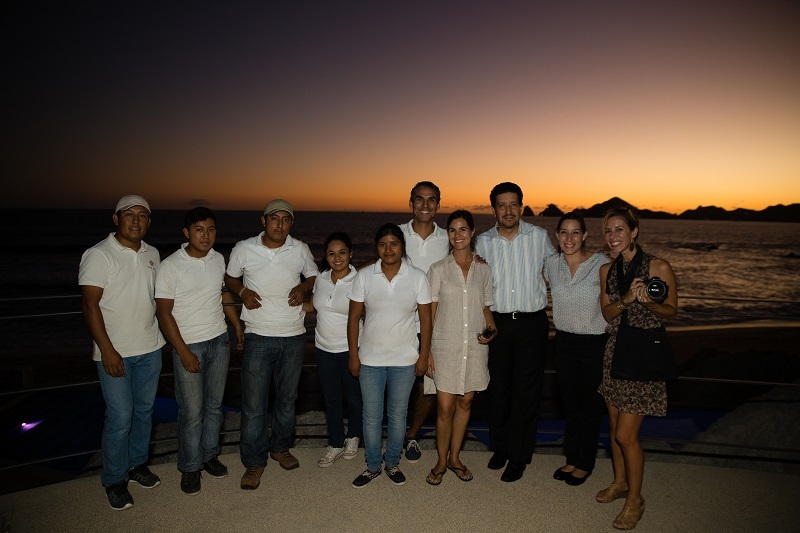 We look forward to collaborating all together again very soon on many unforgettable Cabo weddings! Absolutely gorgeous, as always ♡ Congratulations!